What’s not to love about fluffy little bunnies, even if they are angry all the time?! 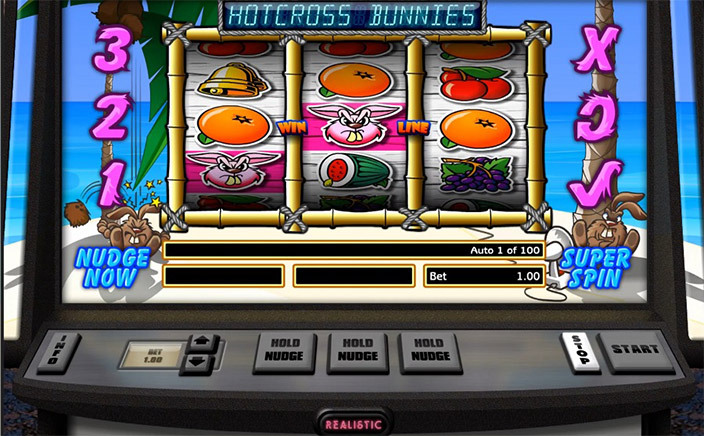 With the Hot Cross Bunnies slot game, you can try your best to put them in a better mood so that they can give you some generous payouts and see where your luck takes you. Hot Cross Bunnies has been made by Realistic Games, which has had quite a bit of gaming success of late. This game is one of the pure classic ones and is pure joy to play on your mobile device. 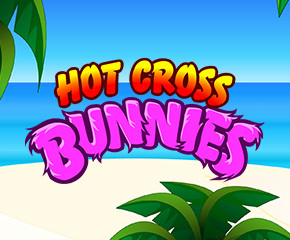 Hot Cross Bunnies is filled with some adorable fluffy looking cartoon bunnies that are very hot and bothered on their tropical island. They seem to need a pick me up, which is where you come in. Try making them feel better by distracting them with some quick game play, in which you can wager a certain amount on a spin and then spin the reels to see if you can win a good deal. The game is packed with some great bonus features that make you want to keep playing and every so often you hear a cute little bunny squeak. The game itself is bright and colourful so it puts you in a good mood immediately. It is a throwback to the classic slot games as it has just three reels along a single payline. To make up for this rather simplistic setting, Hot Cross Bunnies has random bonus features that are triggered whenever the bunnies feel like letting you have some extra fun. Bunny Money Feature: You can activate this feature when three angry pink bunnies pop up on the reels. In this feature, you have another reel appear and the reels on this wheel do not stop spinning until you can collect three matching symbols to allow you to win up to thirty times your wager. Nudge Feature: You can get as many as three nudges at random during the game. Auto Nudge: In this feature, the game picks out the best possible outcome for you, or you can give yourself a nudge, or a bunny will volunteer to give you a winning payline in case you aren’t too lucky yourself. Hold After a Win: You can get up to four holds on symbols in a winning payline so that you can look forward to more wins. Super Spin bonus: In this feature, you get just one free spin in which you have a guaranteed win waiting for you. There is plenty to love about these funny little angry bunnies and this is one slot game you wouldn’t want to miss, especially for its random, generous bonus features.